If there’s anything we’ve learned about Uber over the past few years, it’s that the app-based taxi service company doesn’t like to do things quietly. On Wednesday, Uber released the first renderings for its new downtown San Francisco HQ, and yep, they’re every bit as over-the-top and intentionally futuristic as you’d imagine. One word: Glass. So much glass. The new Uber headquarters, designed by SHoP Architects and Studio O+A, will, from the looks of it, be a largely transparent complex of offices, circulation and gathering spaces, held together at the seams by steel beams. 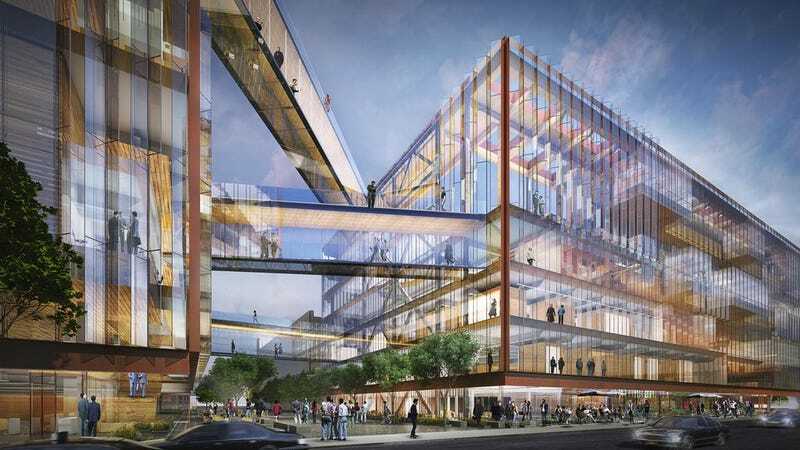 Uber employees will be able to cross between the HQ’s two buildings on angling glass and steel bridges over Pierpoint Lane, a public pedestrian walkway.